If you left all four tires in the same corner of your car for years and years, some tires would wear out faster than others. Worse, some of the treads in individual tires could wear unevenly, with the inside or outside wearing out first. Uneven tread wear is unavoidable. The weight of a car is not distributed evenly to all four corners. The engine, the heaviest single thing in a car, is usually at the front, so the front tires tend to carry more weight. The front tires also take care of all the steering duties. Uneven wear can also be the result of a mechanical problem with the car. 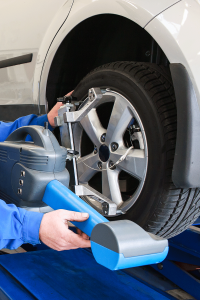 If the tires aren’t aligned properly, some of the tires will tend to drag and wear poorly. Worn-out suspension components can alter the weight distribution, particularly when cornering, adding to tire wear. Tires that are improperly inflated will also wear unevenly. Tire rotations can be different, depending on your vehicle. Some vehicles require different patterns. Unidirectional tires shouldn’t be crossed over, and older bias ply tires should also not be crossed. If your vehicle has different size tires on the front and rear, obviously you can’t switch them. In such a case, simply move rights to the left and vice versa. If you have a full-size spare tire, you should include the spare in the rotation so all five tires wear evenly. Follow the normal rotation pattern, but put the spare at the right rear corner. Whichever tire would have gone to the right rear goes in the trunk and becomes the new spare. If you are not sure when to have a tire rotation done, make sure to contact us, and we can advise you on a correct schedule.